Do you have a special event coming up, Wedding? Holiday? Or just want a brighter smile? There are many reasons why teeth become stained or discoloured, including tobacco use, and drinking dark liquids such as red wine, coffee, tea and cola. The natural ageing process and prescription medication use can also cause yellowing and greying. Fortunately, in most cases, Tindale Dental Centre can remove all your stains and bring your teeth back to their natural whiteness. We are excited to be able to offer our patients two tooth whitening options. Following consultation with one of our dentists we can assess which whitening option is best for you. We can offer you either our new ZOOM!® Chairside whitening system or our take home whitening option. 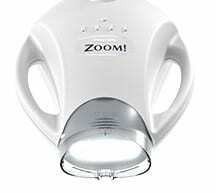 Many people are opting for the Zoom!® Chair side Whitening System (Zoom!®) for fast, safe and effective teeth whitening. Zoom!® combines the newest advances in dental technology with proven chemical formulas. This ensures our team can provide excellent whitening results. As with any whitening system, the post-treatment results will vary according to the degree of initial staining and discolouration as well as the initial condition of the teeth. Following Chair-side whitening, Tindale Dental Centre will provide you with home trays to ensure optimal results can be maintained in the long term. The Dentist will examine and polish your teeth. They will then take impressions of your teeth so that custom whitening trays can be created. At the next chair-side appointment, the gums are protected with isolation material. A whitening gel is then applied to the teeth. The gel is activated by the whitening machine for approximately 8 minutes. This 8 minute cycle is then repeated 3-4 times within the session (depending on the severity of the staining).Many patients are opting for the Zoom!® Chair side Whitening System (Zoom!®) for fast, safe and effective teeth whitening. Zoom!® combines the newest advances in dental technology with proven chemical formulas. This ensures our team can provide excellent whitening results. As with any whitening system, the post-treatment results will vary according to the degree of initial staining and discolouration as well as the initial condition of the teeth. Following Chair-side whitening, Tindale Dental Centre will provide you with custom designed whitening trays for you to use at home . This will ensure optimal results can be maintained in the long term. The Dentist will examine and polish your teeth and impressions for take home trays may be taken. A whitening gel is applied to the teeth. The gel is activated by the whitening machine for approximately 8 minutes. The 8 minute cycle is then repeated 3-4 times within the session (depending on the severity of the staining). Fine cracks in the teeth. Presence of abrasion lesions caused by over brushing. The sensitivity may last up to 24 hours after treatment. Sensitivity will vary from patient to patient. Most people only have mild sensitivity for a maximum of 10 hours. We may recommend a post whitening gel to be used after the appointment to reduce sensitivity. The results are permanent. Over time, you will generate new staining and this is dependent on your lifestyle. We recognise that all people will eventually get new stains, which is why we will provide you with a home maintenance kit so you can maintain the brightness of your smile for the long-term. Take home Dental Whitening is a safe, effective and easy way to get professional results. At Tindale Dental we will construct custom made fitting guards. These guards guarantee the most comfortable and effective way to dispense and use Take home whitening kit. 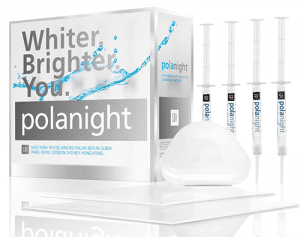 Our dentists use and recommend SDI Poladay and Polanight whitening systems. SDI Pola Day or Pola Night is an effective take-home whitening system that is made in Australia. This advance teeth whitening system’s formula reduces post whitening sensitivity and provides quick and noticeable results. Pola advanced tooth whitening systems provide safe and reliable tooth whitening to suit your needs and lifestyle. The gels contain a desensitising agent which acts on the nerve endings, and desensitises them at the pulp-dentin border, in turn minimising sensitivity and maximising patient comfort. Neutral pH ensures the full release of the peroxide without jeopardising your comfort. NOTE: Individual patient results may vary. At Tindale Dental Centre we are proud of our teeth whitening program .We offer extended hours and convenient parking so as to make teeth whitening available to as many of our patients as possible.